The view from the office of Ioannis Papakonstantinou at University College London affords a great perspective on a wasted opportunity. 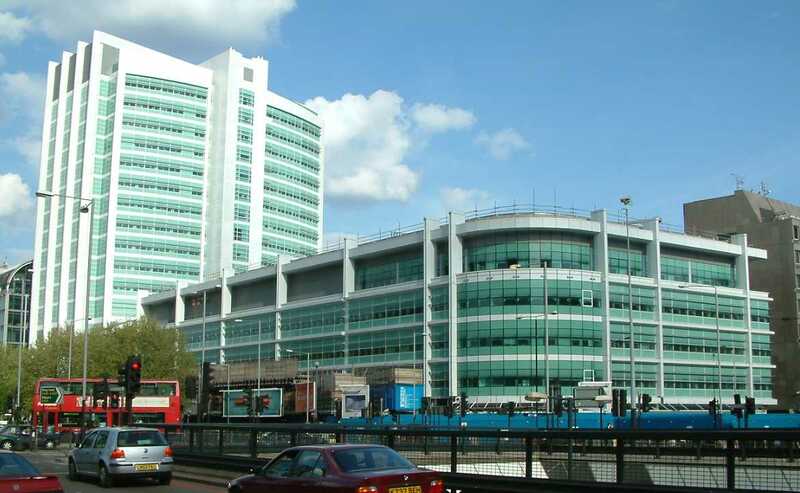 He points to the university hospital, a tall oblong block adorned with decorative green glass strips. They look modern but serve no purpose. They don’t even let in light. Papakonstantinou is one of many who have dreamed of turning glass panels into photovoltaic modules that can be integrated directly into buildings, both for decoration and to look through. His lab is among many groups and companies developing widely differing approaches to solar windows; some are already installing them in buildings. The appeal is, well, clear. Such windows would unobtrusively generate power for the building while allowing its occupants to peer out onto the street, enjoy natural light, or watch clouds pass overhead. By 2020, 8.3 billion square meters of flat glass will be installed annually in new buildings worldwide, according to the Freedonia Group. That area, covered in standard solar panels in the ideal orientation, could produce more than a terawatt at peak output, and over one year it could generate some 2,190 terawatt-hours. That’s 9 percent of what the world’s annual electricity consumption was in 2016. Substituting this source of energy for coal in 2017 would have saved about 1.6 percent of carbon emissions from fossil fuels, industry, and changes in forestry and land use. Catch Some Rays: UbiQD’s glass prototype uses quantum dots, the light from which is shunted sideways toward solar cells in the frame. And powerful regulatory forces are now dragging solar windows and their environmental benefits into reality. A European Union directive requires all new buildings to meet a “nearly zero-energy” standard by the end of 2020. Japan, following the Fukushima Daiichi nuclear disaster, has gone further by requiring all new public buildings to be zero energy by 2020. Solar windows will never be as efficient as conventional solar panels, because windows must of course remain at least partially transparent. But they can create an enormous network of small photovoltaic sources. And developers maintain that the money that the windows save on energy will repay the cost of installing them. Already, the cost difference is pretty small, says Thomas Brown from the University of Rome, in Italy, who used to develop solar windows. Adding power-generating components to window materials could pay for itself in less than a decade, he says. And there are various technologies, each with different costs and features. Developments now under way will therefore determine whether this technology will take off and, if it does, which of the many approaches will dominate. AT&T’s Bell Telephone Laboratories commercialized photovoltaic cells in 1954, when it unveiled its silicon-based technology. Today, rooftop solar panels still commonly use such cells. When they’re hit by photons, electrons in the silicon crystal lattice are nudged into a higher energy level, leaving a positively charged hole behind. Electrons and holes then move in opposite directions through silicon layers toward the cell’s electrodes, producing electric current. Ideally, a standard solar panel would harvest every photon possible. However, solar panels doubling as windows can be useful just by absorbing certain photons—particularly those in the ultraviolet range, which fade colors and can be harmful to people, as well as photons in the infrared range, which raise indoor temperatures. To block these photons, normal window glass is often given a low-emissivity (low-E) coating, which also blocks at least 10 percent of the incoming visible light. Solar coatings can use these commonly blocked frequency bands to generate electricity. However, it’s hard to put electricity-generating components into a window. Windows must also generally meet stringent standards for stability. Such challenges make solar windows difficult to produce and sell. Hunter McDaniel, chief executive officer of UbiQD, in New Mexico, is convinced that his company’s technology has key advantages in these areas. The “QD” in the company name stands for quantum dot, a semiconducting nanocrystal. QDs can fluoresce, re-emitting light in response to radiation; they belong to a class of substances known as fluorophores, which are widely used for labeling biochemicals. QDs can also be embedded in transparent material within a solar window to form a luminescent solar concentrator. LSCs trap light within the windowpane and then redirect it to a nontransparent solar cell mounted on one edge. After absorbing incoming light, fluorophores re-emit a different color, which bounces between the window’s surfaces toward the solar cell, rather than escaping or being reabsorbed by other dots. Other companies, including Glass to Power, in Milan, and Physee, in Delft, Netherlands, also use this approach. The best QDs have high quantum yields—they re-emit a lot of the light they absorb, the proportion varying with the color of the light. McDaniel says that UbiQD has created infrared QD fluorophores that enable “color-neutral” LSCs, which do not alter the colors of items seen through the windows, with an 80 percent quantum yield. For visible-light fluorophores, the quantum yield is 95 percent. “There’s simply nothing else even close to that,” McDaniel insists. Most competitors, including Papakonstantinou, use organic dye molecules as fluorophores, but McDaniel says these dyes are not particularly stable. “Put a newspaper out in the sun and watch how quickly the ink fades,” he says. The same breakdown process causes stability problems in solar windows using organic photovoltaics (OPV), McDaniel claims. Both McDaniel and Papakonstantinou acknowledge that LSC technology is still at an early research stage. Sarah Kurtz, a photovoltaics expert at the U.S. National Renewable Energy Laboratory (NREL), in Colorado, echoes this. “I haven’t seen any reports that imply they are moving into large-scale production,” she says. By contrast, after developing products for more than a decade, SolarWindow Technologies, in Maryland, signed a contract in August 2017 to manufacture its OPV technology. Stained-Glass Generator: Onyx Solar’s 20-percent-transparent photovoltaic glass modules form a mosaic on the roof of the Béjar market, in Salamanca, Spain; they generate a peak power output of 4.1 kilowatts. SolarWindow’s most advanced process sprays liquids onto glass, where they form solid organic polymers in a multilayer sandwich. The central filling is an absorber polymer layer where electrons and holes separate. Other polymer layers help electrons and holes move toward their electrodes. In 2017, SolarWindow licensed its spray-on coating process to Triview Glass Industries, a manufacturer based in Los Angeles. SolarWindow has raised money for equipment for the collaboration but has not said when it will begin selling windows based on the technology, or how much they will cost. However, John Conklin, SolarWindow’s chief executive, insists that his company is committed to getting close to standard window prices—around US $500 for a square meter of continuously insulated pane, according to the Freedonia Group. Another of SolarWindow’s goals is a window that transmits up to 85 percent of visible light while blocking infrared and ultraviolet. The exact transparency, color, and tint will dictate power output, which SolarWindow is not yet ready to disclose. But it’s not hard to estimate what the output could be. Normally, around 1,000 watts per square meter of solar energy falls on Earth’s surface. If a solar window is 50 percent transparent, it will absorb 500 W/m2. The record efficiency for an organic photovoltaic cell—the percentage of light power converted to electrical—stands at 11.5 percent. If SolarWindow can deliver 10 percent efficiency, then a 1-meter-square window’s peak output will be 50 W, or enough electricity to power eight cellphone chargers. Through a Glass Brightly: This skylight at the Lucia Building at the University of Valladolid, Spain, allows for the natural lighting of the building while producing up to 5,550 kilowatt-hours per year. California-based Ubiquitous Energy is vying with SolarWindow to bring transparent OPV-coated glass to market, IDTechEx’s He notes. But because it’s challenging to hit efficiency targets and scale up production, companies’ commercialization efforts are still at “a very early stage,” she believes. Questions about commercialization prospects are also tempering excitement about one of the newest photovoltaic materials: the perovskites, a class of hybrid organic-inorganic substances. The technology is similar to that of OPV, but here the middle of the sandwich consists of perovskites rather than the polymer that SolarWindow uses. But unlike polymer absorbers, perovskites are semiconductors, which means that they can transport electrons themselves, making it possible to shrink or eliminate other layers in the sandwich. 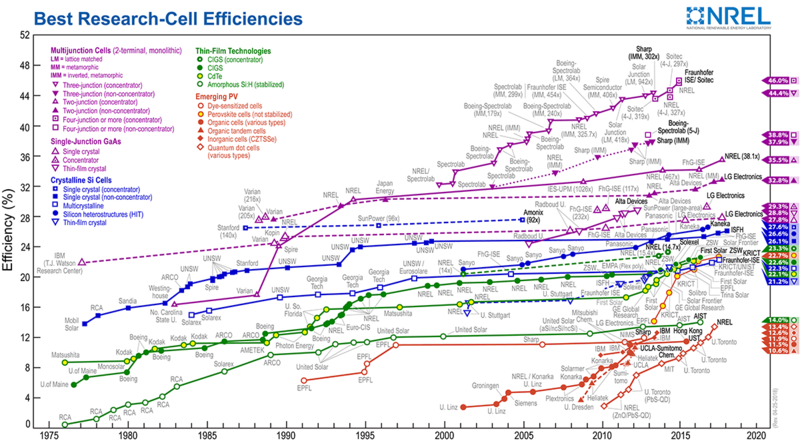 This capability, together with the fact that perovskite devices are easier to fabricate, has helped raise their efficiency to 22.7 percent, up from 3.8 percent in 2009. Perovskites are sensitive to moisture, but English startup Oxford Photovoltaics says it has solved this problem by developing less sensitive formulations and by encapsulating them tightly. Oxford PV has worked on solar windows, but right now the company intends to use its most advanced, moisture-resistant product only in regular solar panels. By putting a semitransparent perovskite layer in front of the standard 6-inch silicon solar cells, Oxford PV produces “tandem cells” with 25 percent efficiency. Pick a Color: The different colors of these Oxford PV solar cell prototypes show how easy it is to tailor their perovskite components to absorb different wavelengths. Light Into Power: Oxford PV chief technology officer Chris Case holds a tandem silicon solar cell wafer featuring a perovskite coating, fresh off the firm’s pilot assembly line, in Germany. “My fear was that a building-integrated photovoltaic product would take more years than we could afford,” says Chris Case, Oxford PV’s chief technology officer. As with any new material, he says, it would be “a lot of work” to scale from 1-square-centimeter research cells to producing sufficiently uniform windows of 600 by 1,200 millimeters. Oxford PV therefore wants to perfect its technique on smaller silicon cells in the hope that it could later be applied to larger windows. Currently, Oxford PV’s prototype perovskite-only cells are slightly below 20 percent efficiency. The company is working with an unnamed partner that expects to offer tandem cells to customers in 2019, Case says. On his road map, wholly perovskite cells appear several years after that, perhaps including solar windows. Case doesn’t care whether wholly organic coatings or other technologies might be closer to commercialization. In fact, he would welcome it if his competitors went first and resolved the fundamental regulatory, architectural, and practical challenges. “Ultimately, our material should outperform any other technologies,” he says. He may get his wish, because at least one company is already supplying transparent solar cells to building contractors. I’m on the ground floor of an office building in London, gazing up at a photovoltaic skylight, seven stories above. I see that some practical challenges of integration are being met. The energy-generating areas in the middle of the panes appear darker than the surrounding glass, making them easy to spot. This 16-by-8-meter system was produced by the Spanish company Onyx Solar. Onyx turns thin-film silicon solar panels into photovoltaic skylights by using lasers to etch patterns into the panels, making them more transparent. “We remove the opaque silicon layer and back contact by laser scribing,” explains Álvaro Beltrán, Onyx’s chief executive officer. The company’s products range from opaque to 30 percent transparency. By comparison, most sunglasses are 18 to 45 percent transparent. Light House: This view of the Lucia Building shows how natural the lighting can be from the photovoltaic skylight. The building I’m in uses the 20-percent-transparent product, explains Gavin Turnbull, project manager for McLaren Construction Group, the building contractor. Turnbull and I take the elevator to stand just below the skylight, where I can make out lines of tiny rectangular solar cells running across the glass. Around the edge, a strip of conductive aluminum tape connects them; it disappears into the transoms between the panels, where more conventional wiring hides. Physically installing the skylight was simple, Turnbull says. However, communicating with Onyx about how to wire the panels in was challenging: The skylight initially produced electricity at a much higher voltage than intended. Workers solved the problem around a month after my visit, and the system now operates properly. Since Onyx’s factory opened in 2015, panels have been installed in some high-profile buildings, including the Miami Heat’s basketball arena. Onyx claims that installation paid for itself in less than a year. The company is now manufacturing over 5,500 square meters of semitransparent photovoltaic glass for what Beltrán says will be the world’s largest photovoltaic skylight. Fittingly, given the technology’s silicon heritage, it will be installed in the redeveloped Bell Works building in Holmdel, N.J.
And it costs only 10 percent more than conventional low-E glass, according to Beltrán. For instance, in New York City a 3,400-square-meter skylight of 10 percent transparency would cost roughly $172 extra per square meter to install. However, the additional cost would come down to just $48 after taking incentives into account. That sum can be paid back in less than two years, given the 380 kilowatt-hours the skylight would produce each day, on average, Beltrán claims. Sculpting Silicon: To produce the photovoltaic skylight at 25-32 Chancery Lane, London, Onyx Solar etched this coarse grid into a thin-film silicon panel. Though a few new buildings already generate power from their skylights and windows using products like Onyx’s, retrofitting existing buildings would arguably be much more difficult and expensive. However, back in Papakonstantinou’s office, he slaps a square of orange plastic—one of his team’s own LSCs—onto a window. As it sticks there, I see that the LSC’s concentrating effect makes light shine more brightly around the edges than on its face. “If we were looking to commercialize this,” Papakonstantinou says, “we could convert existing areas of large buildings” to electricity-generating windows. Mark Portnoi, a University College London grad student, built a 250-by-250-millimeter prototype from this material, integrated with commercial cells, and exhibited it at the London Ecobuild show last March. Such a product could also be added to many everyday objects, like cars, computers, and cellphones—“photovoltaics on things,” as Kurtz calls it. These applications could be an important fallback position for Papakonstantinou’s technology, as well as those of Oxford PV, SolarWindow, and UbiQD. And they may well need that fallback. With a group of successful installations already behind it, Onyx has jumped out to an early commercial lead. On the other hand, barring a revolutionary innovation, it might not enjoy a wide market because of limitations on the degree to which laser etching can make silicon panels transparent. Therefore, the race for true solar windows is still on, even if the most promising competitor—Oxford PV’s perovskite technology—is still several years away. So too are LSCs like UbiQD’s and Papakonstantinou’s. It’s possible that SolarWindow’s OPV technology will make it to market this year, but if it does, the company must still convince people that its technology really is mature enough. Solar Siding: The Genyo Building, in Granada, Spain, bears 550 square meters of 20-percent-transparent photovoltaic glass. Yet each approach may find acceptance independently if it “wins the hearts of the architects,” Papakonstantinou says, quoting the advice of an unnamed official at one of Europe’s largest building companies. A correction to this article was made on 20 February 2018. Andy Extance is a freelance science writer based in Exeter, in the United Kingdom.